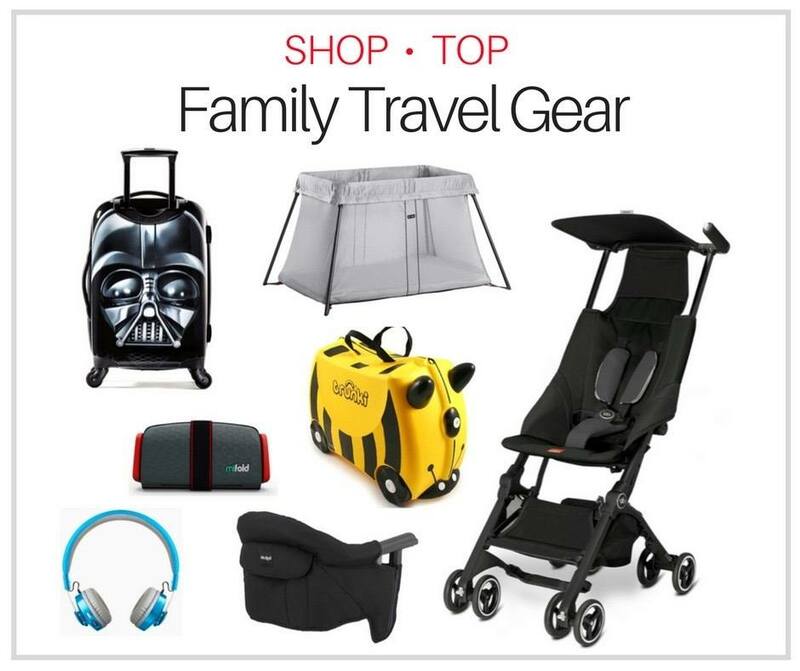 Planning a Whistler family vacation? Whether you are looking for the top Whistler kids activities, Whistler kids ski free deals, family-friendly restaurants, or the best hotels in Whistler for families — we’ve got you covered here. In a hurry? Please see the following menu to find what you need quickly . My kids cut their first turns in Whistler kids ski lessons. I still remember dropping my eldest off at the age of three for a 5-day Whistler kids camp and thinking that there was no way that he would be skiing by the end of the week. Boy, was I wrong. He was up and going in his pizza stance by the end of day 2. 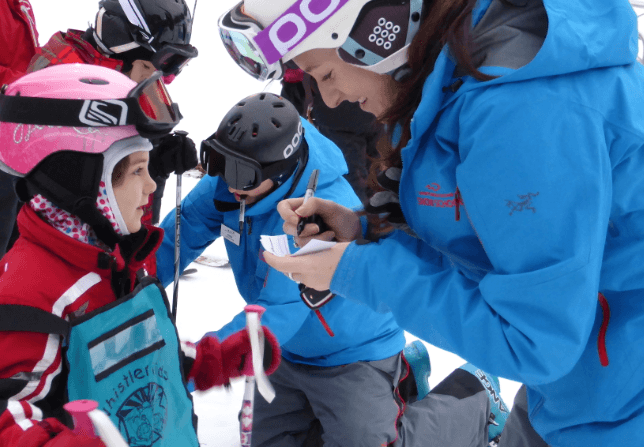 Whistler makes kids ski and snowboard lessons easy on parents. There are many options to choose from to suit your child’s needs — from 1 day to 5 day kids adventure camps. There are also three different drop-off points for kids lessons (Whistler Kids Creekside, Whistler Kids Blackcomb and Whistler Village Kids), so you can pick the location closest to where you are staying. Learn more at Whistler Snow School. First of all, kids under 6 years of age always ski and ride for free at Whistler Blackcomb. Please note that a child still needs to have a scannable pass picked up from one of the ticket offices (or included with kids lesson packages). 1 free rental for kids who have never tried skiing or snowboarding. To register your child for the EPIC School Kids program, click here and book your child’s lesson through Whistler Blackcomb Reservations 1-800-766-0449. Note: Unfortunately, the Epic School Kids Program is full for the 2018-19 season. 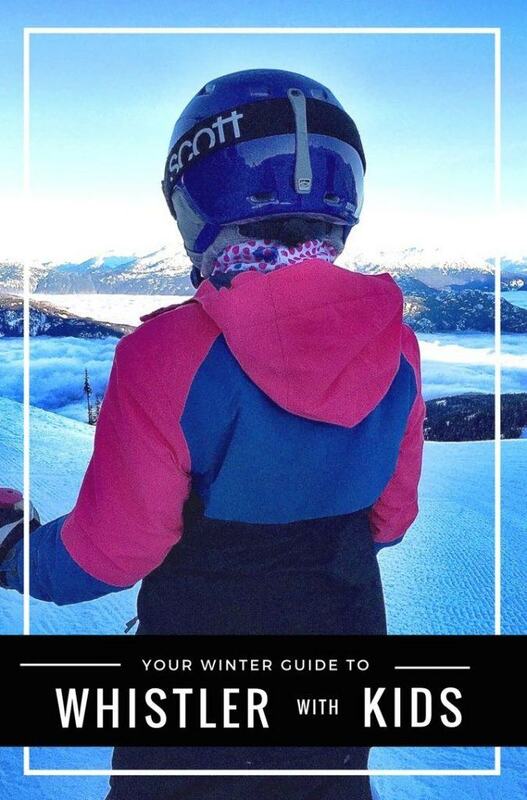 Typically, registration starts in the spring, so I recommend signing up for Whistler Blackcomb emails here if you are interested for the 2019-20 season. From 18 months to 48 months: For those parents visiting Whistler with toddlers that need child minding, Whistler Childcare has four different licensed daycare facilities for children 18-48 months. Whistler kids daycares can fill up very quickly, so be sure to reserve this service well ahead of time, especially during holiday periods. See Whistler Kids Childcare for more information. Full day care at these facilities is $115/day (8am-3:30pm). Whistler Blackcomb is committed to their family programming. Family Certified icons are displayed on ski runs, in stores, and in food and beverage locations to indicate kid-friendly areas, products and services. Signage and flags also indicate on-mountain ski/snowboard areas to better mark child-friendly and beginner terrain. You’ll find all kinds of Whistler Blackcomb kids on-mountain fun on this list to check out while exploring these two side-by-side mountains. Note: Whistler and Blackcomb mountains are considered one resort (no need to buy separate passes). They are connected near the top by the Peak-2-Peak gondola. The Whistler Mountain Kids Training Centre — featuring a large skills zone and a race training zone. The Whistler Family Zone and Bear Cub run (the signage in this area discourages aggressive skiers and boarders). The area also has a brand new six passenger high speed lift, replacing the old Emerald Express chair. 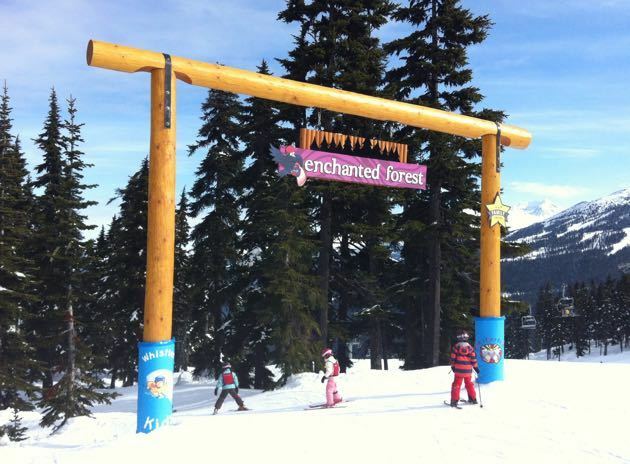 The Blackcomb Kids Magic Castle and the Whistler Tree Fort – both great for a little on-mountain break. The Enchanted Forest run on Whistler Mountain. The free Nintendo Gaming Lounges at the Roundhouse Lodge (Whistler), the Rendezvous Lodge (Blackcomb) and at the Wizard Grill (Blackcomb Base). 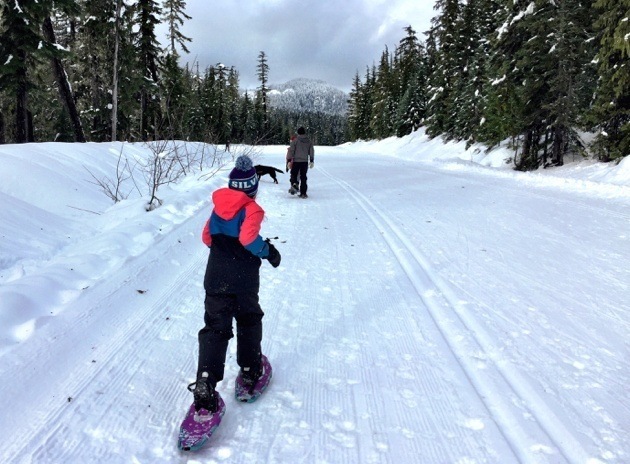 Wondering what to do in Whistler with kids? Whether you are looking for Whistler toddler activities or fun for tweens and teens, you’ll find the top family attractions here. Make your Whistler family vacation your best holiday yet ! Enjoy family fun at this fantastic outdoor covered skating rink. Free for the whole family (skate rentals are $6 , helmets are free); this is a great option in any kind of weather. The rink is open daily from 11am – 8:30pm (closed for ice maintenance 1:30pm -2:30pm and 5pm – 6pm). Too cold? Warm up by the fireplace or the outdoor fire pit. The Whistler outdoor skating rink is located at Whistler Olympic Plaza (map). See website for more details. Looking for things to do in Whistler as a family? 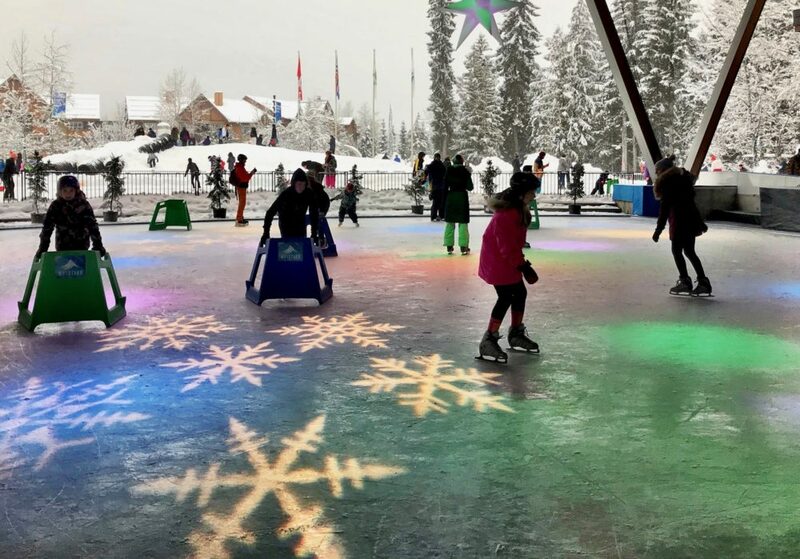 Family Après at Whistler Olympic Plaza runs on Monday and Wednesday afternoons from 3pm-6pm (Dec. 17th, 2018 to March 27th 2019). Designed for families with kids of all ages, the events include a variety of entertainment and family activities that change from week to week – snowman building competitions, tobogganing, storytelling, roving characters, music, mini hockey, snacks, hot beverages and more. See website for further details. New to Creekside Village this holiday season is a pop-up gingerbread house. The life-size festively decorated space will feature a large play train, gift wrapping and Santa visits. 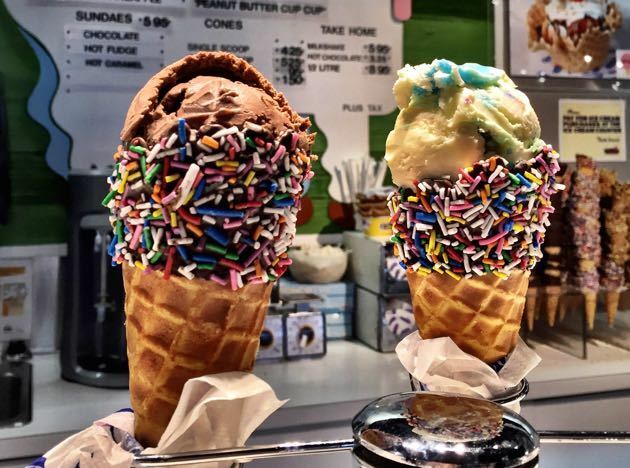 Coffee and hot chocolate will be available and kids will also be able to create their own Cloud Cones (ice cream cone topped with cotton candy). This fun family attraction will be open from Whistler Blackcomb’s opening day through Spring 2019. 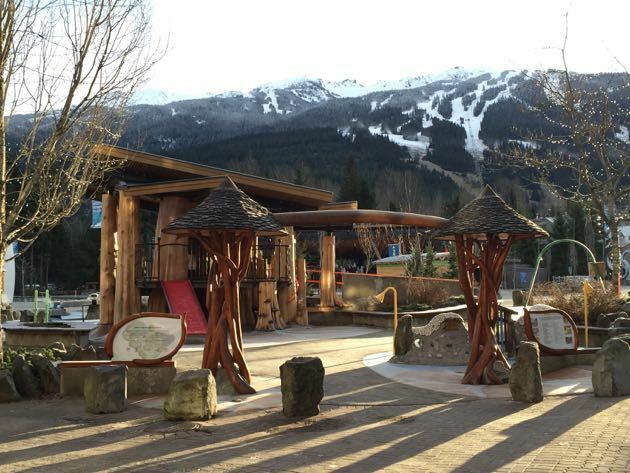 This picturesque Whistler Village playground has features suitable for a wide range of ages, including toddlers. As an added bonus, it is surrounded by coffee/tea shops (Starbucks, Blenz, Purebread, David’s Tea) and other kid friendly attractions (skating rink, library, toy store, and the candy shop). The playground is located at Whistler Olympic Plaza (map). Note: In the deep of winter, this playground closes due to safety issues (ice). In such winter conditions, however, there is normally a large pile of snow nearby that kids can slide on (plastic sliding saucers can be rented for $6 at the adjacent ice arena – helmets are free). 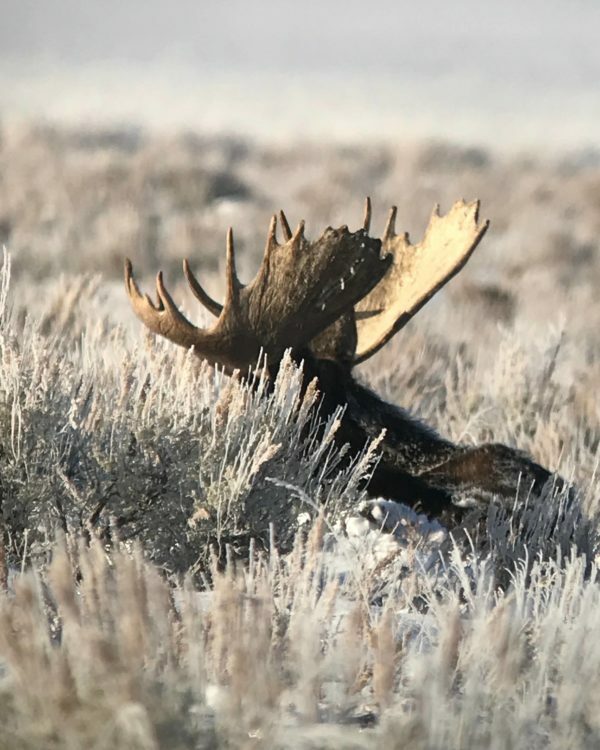 A great stop if you are looking for things to do après ski. Whole Toys is located close to the playground and the candy store (map). See Whoola facebook page for hours. This mountainside tube park is great fun for the whole family and wonderful for kids who still have energy to burn after a day on the mountain. 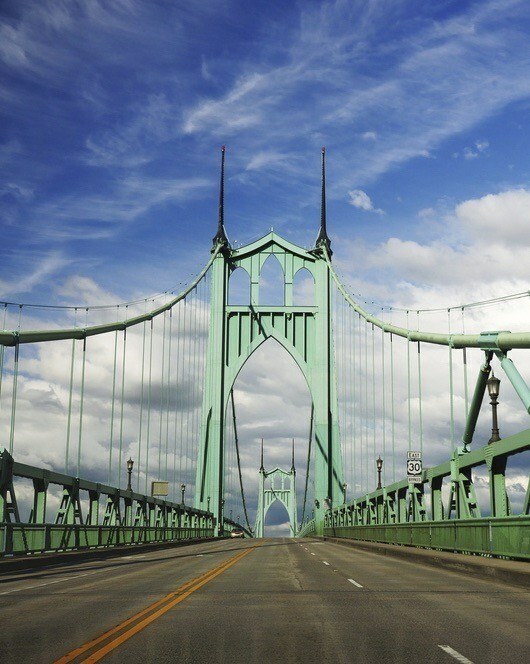 Kids must be at least 3 years, 36″ tall and accompanied by an adult if under 12 years. The tube park is located at Blackcomb Mountain (Base2) with access from the Excalibur Gondola. See website for more details or read reviews for the tube park on TripAdvisor. ZipTrek Whistler offers the year-round exhilarating experience of flying through the air through the treetops and over a canyon. My son tells me that riding in the winter is even better than the summer because there aren’t large crowds (less time waiting around). Several different tour options are offered for kids 6 years and up, although to ride the super long Sasquatch line, riders must be at least 10 years old. Learn more on their website or read reviews for Ziptrek Ecotours on TripAdvisor. Alternatively, just a 10 minute shuttle ride north of Whistler you will find Superfly Ziplines, an adventure center that offers an exciting winter zip line tour. The tour starts with a custom 4×4 climb up Rainbow Mountain, followed by a winter wonderland zip line tour through old growth forests. The highlight of the tour is a ride on one of Canada’s longest ziplines at well over a kilometre long and 600 feet high. Kids must be 7 years and at least 60 lbs (27.3kg) to ride. 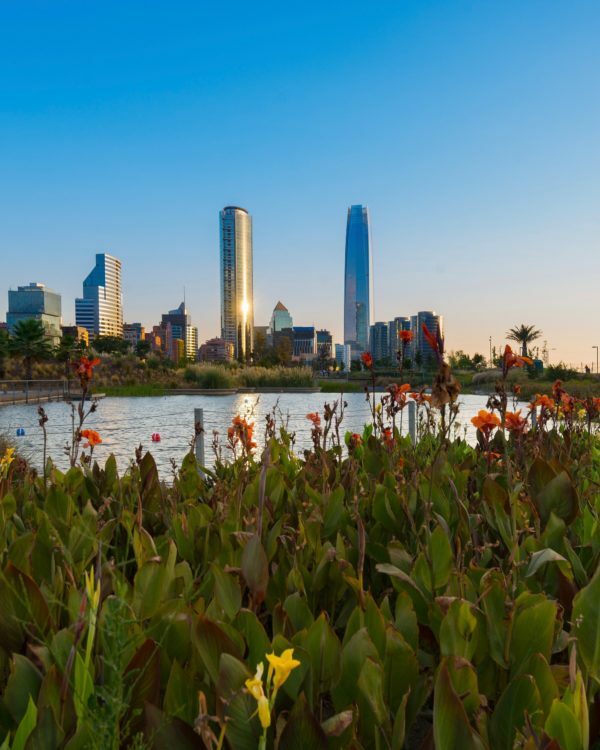 Learn more on their website or read reviews for Superfly on TripAdvisor. 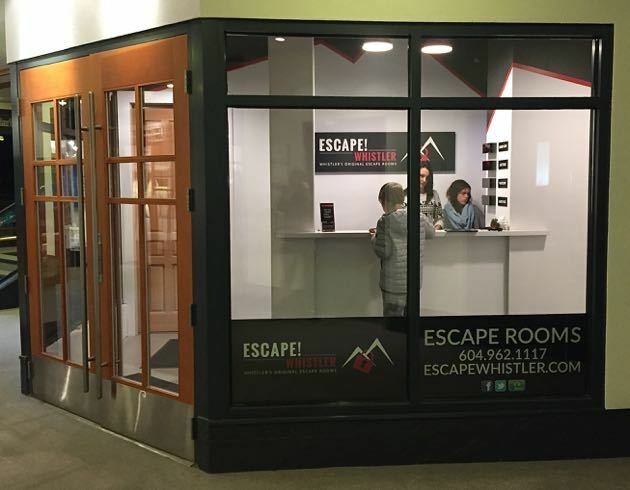 Escape Whistler is a real-life gaming experience where groups of 2 to 6 people are placed inside a themed room. Groups are presented with puzzles, riddles, and clues – working together to solve them within 45 minutes in order to “Escape” from the situation. Themes include The Pirate Ship, The Pinball Machine, The Buried Cabin and The Rabbit Hole. Escape Whistler is conveniently located right in the heart of Whistler Village, near the Whistler Village Gondola (see map). Children 12 and under must be accompanied by an adult. See website for more details or read reviews on TripAdvisor. Note: I had the pleasure of trying out the Pirate Ship room with my son recently. While we didn’t quite escape in the 45 minutes allotted, we sure had a ton of fun and can’t wait to try another room. Enjoy skating in the indoor ice arena, working out at the fitness centre, and swimming in the fantastic pool (includes a lazy river). Please see website for drop-in times and rates. The centre is located 5 minutes north of Whistler Village on the Sea to Sky Hwy (map). 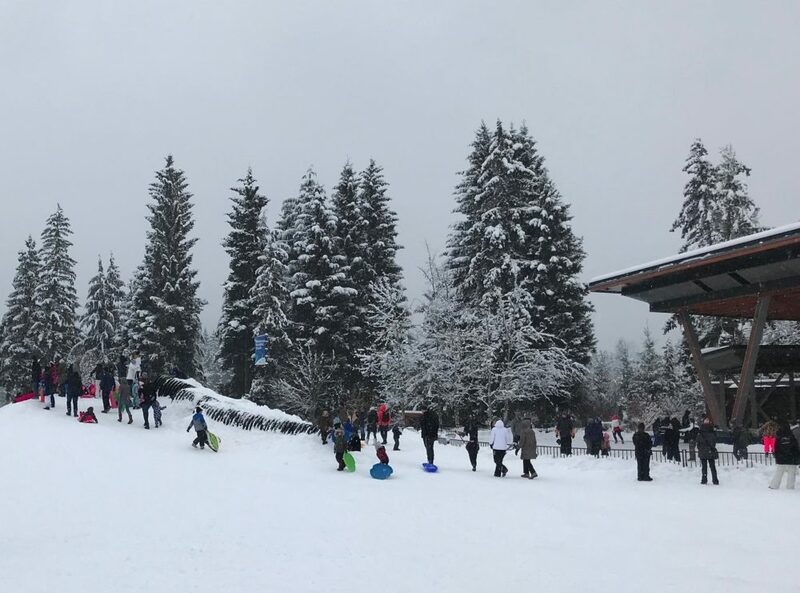 Whistler Olympic Park (a 30 minute drive south of Whistler Village) offers hours on end of all-ages family fun with one convenient pass (cross country skiing, skate skiing, snowshoeing, tobogganing and more!). You can even bring the family hound along on certain dog-friendly trails ! The Whistler Olympic Nordic Centre has all your equipment rental needs taken care of (including baby Chariot rentals for the ridiculously fit). Enjoy the venue’s dedicated sledding hill for multiple runs on saucers, carpets or toboggans. Borrow or bring your own sled and helmet. Rentals and access to the toboggan hill are free with admission to the park. Vehicle access to the toboggan hill is $10.00 plus $5 for every extra passenger (driver and kids 6 and under are free). See website for more information or read reviews on TripAdvisor. Note: All sliders 18 and under must wear CSA approved helmets. Helmets are strongly recommended for all sliders. Free toboggan and helmet rentals are available at the Day Lodge. Availability is limited and a valid credit card is required for deposit. 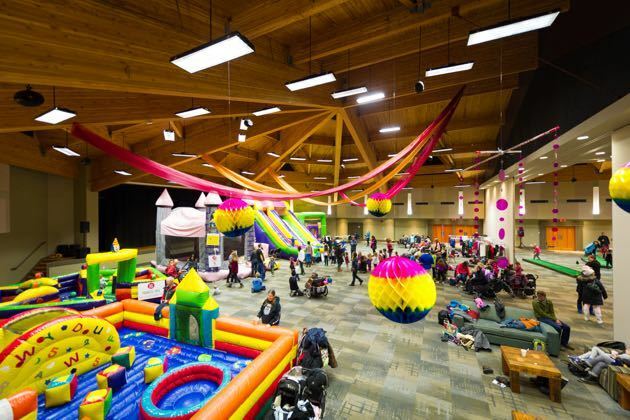 During the Christmas holidays the Whistler Conference Centre hosts a kids’ fun zone including a ton of bouncy castles, a putting zone, movies and air hockey – all for free ! This is a perfect choice for people looking for activities in Whistler for toddlers during the busy holiday season. The Whistler Holiday Experience will be open Dec. 22nd – Jan.6th, 2019, 10am-6pm (closed Dec.25th and 31st). 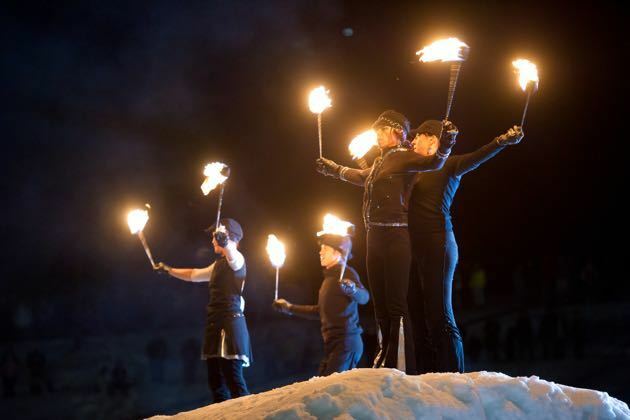 Whistler Blackcomb turns up the heat every Sunday with a free Fire & Ice Show. The whole family can enjoy watching skiers and snowboarders jump through a dazzling ring of fire, flanked by fire spinners and fireworks. The event is held every Sunday night at 6:30pm and there is a special show on New Year’s Eve at 11:30pm. The show happens at the Skiers Plaza in the main village (map). See website for more details. Enjoy a movie with your family when you are not on the mountain. With eight theaters, there is usually at least one “G” movie playing. The theatre is located at 4295 Blackcomb Way (map). See website for showtimes. Looking for things to do in Whistler with a baby? The library has some wonderful free drop-in programs for parents and little ones including Rhyme and Song (Tuesdays) and Singing with Babies (Saturdays). The library is located within Whistler Village at 4329 Main St. (map). See website for more details. 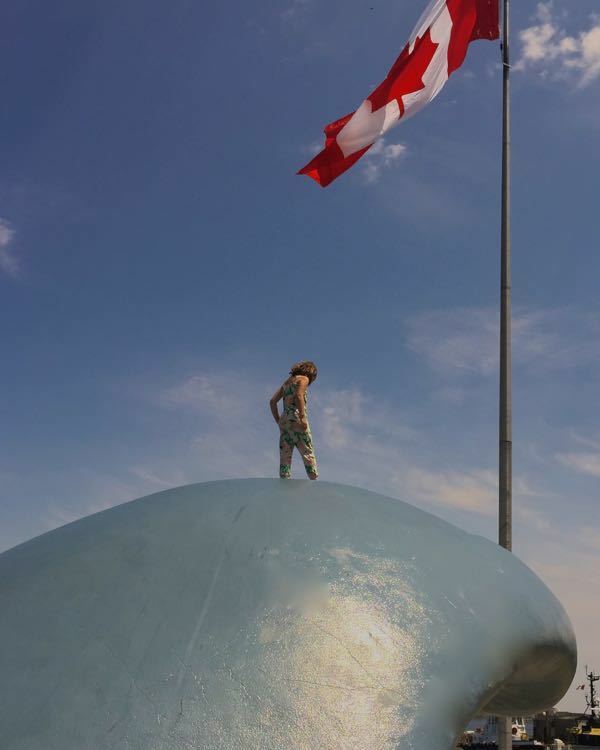 I would also recommend checking the Arts Whistler website for other things to do in Whistler with toddlers and wee ones. Looking for a Whistler kids camp that does not involve skiing or snowboarding? The Core offers kids climbing classes and camps for children 4 years and up. 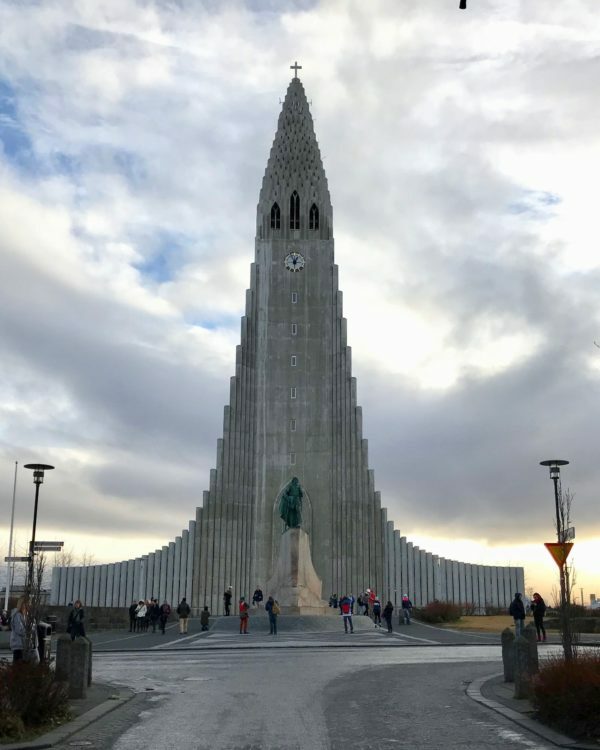 They also offer a popular Climb and Dine program every evening for children 6-14 years – allowing parents to enjoy a night out on the town…or at least 3 hours. They are located at 4010 Lower Whistler Conference Centre (map). See website for more details or read reviews on TripAdvisor. Do you have a youngster who just wants to see what it’s like at the top of the mountain? 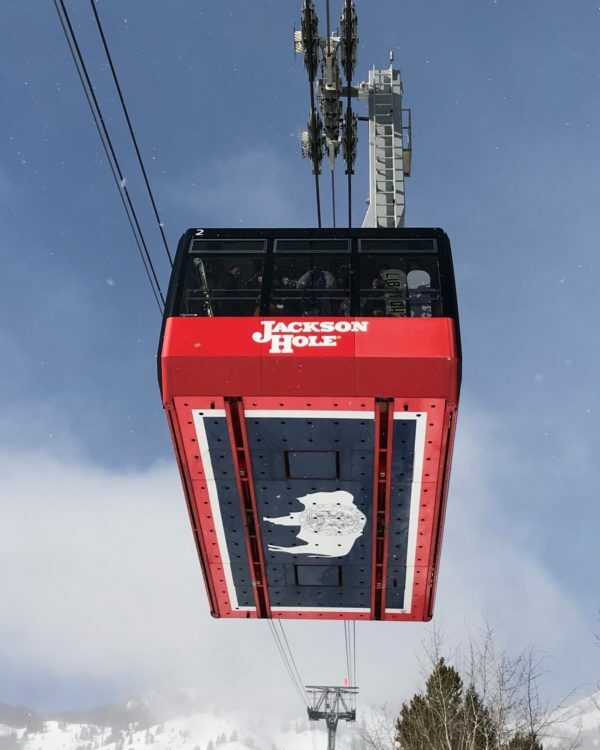 Try the Peak to Peak Gondola Experience. The gondola leaves from Whistler Village. See website for more details or read reviews on TripAdvisor. The Squamish Lil’wat Cultural Centre is an authentic cultural activity for the whole family. It was created to celebrate the joint history of the Squamish and Lil’wat Nations, featuring exhibits that showcase their creative works and cultures. Performances, crafts and guided tours engage guests and create a memorable experience. The centre is located at 4584 Blackcomb Way (604) 964-0990 (map). See website for more details. 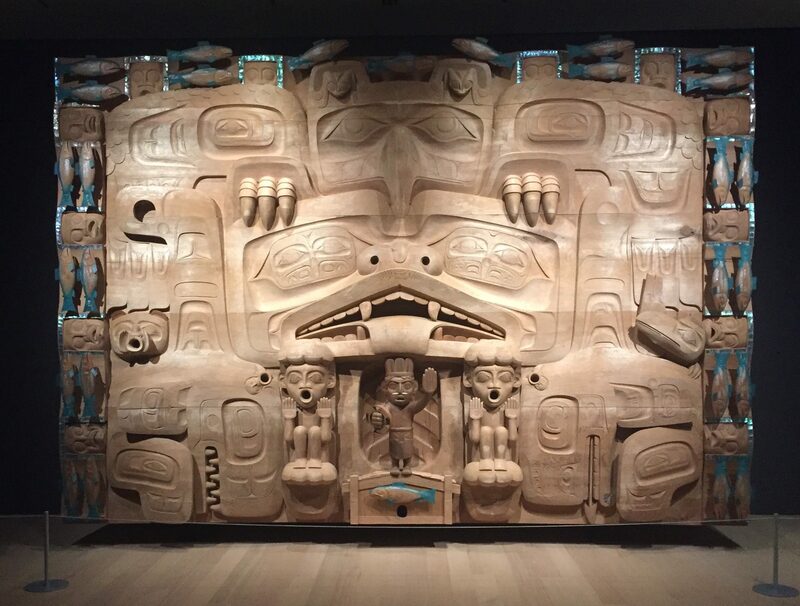 While museums are not always the easiest with kids, Whistler’s lovely Audain Art Museum does a great job engaging little ones with their Family Studio Sundays (12-4pm). Each month has a different theme, with activities inspired by a range of works in the Museum’s permanent collection. Learn more on the Audain Art Museum Events page. Looking for the best Whistler family accommodations? The best place to stay in Whistler with kids can depend on a number of factors (lively vs. quiet, proximity to Whistler kids lessons etc.). The following properties are our picks for the top Whistler hotels for families. I would like to recommend that before you go to the list, that your please first read this little section regarding the location of the three village bases. Understanding the layout of Whistler Blackcomb Resort will help you to plan what is most suitable for you in terms of finding the right family-friendly Whistler accommodations. The two mountains sit side-by-side. 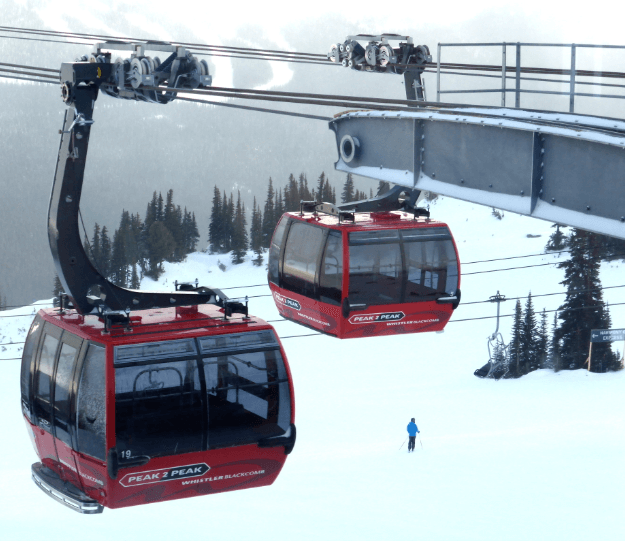 When driving toward them from Vancouver, you hit Whistler Mountain first and Creekside Village Base where you have gondola access to Whistler Mountain. A two minute drive further takes you to the larger Whistler Village Base (The Village) where you have access via lift or gondola to both mountains. A one minute drive further and you will arrive at Upper Village Base (or Base ll ) where you have gondola access to Blackcomb Mountain. The two mountains are linked at the top by the Peak-2-Peak gondola, so regardless of where you stay, you can still experience both mountains on the same day. 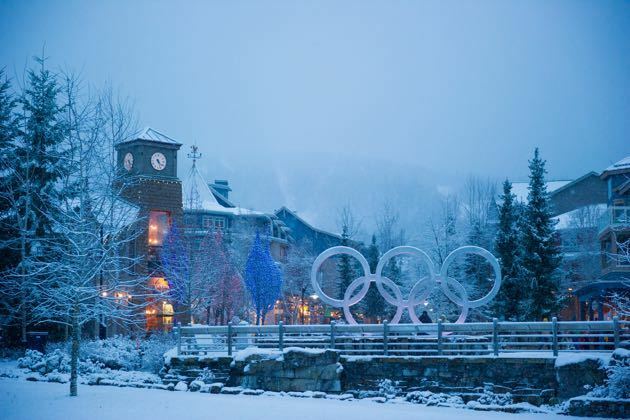 What is important to know, is that although Whistler Village proper is where most of the stores and restaurants are (and a lot of the action), it can sometimes be a little noisy at night. Creekside Village is quite quiet but still has several family friendly restaurant options. Blackcomb Upper Village Base is very serene and is just a 10 minute picturesque walk to Whistler Village (my personal favorite – providing the best of both worlds). All bases have Snow School drop off points and Whistler daycare facilities. This map may help to give you a better understanding of the layout. Whistler hotels charge an additional $20-$62 for overnight parking. If you are staying in the main village, you can optionally park in the Whistler Conference Centre underground lot for $15/24hrs (see map). 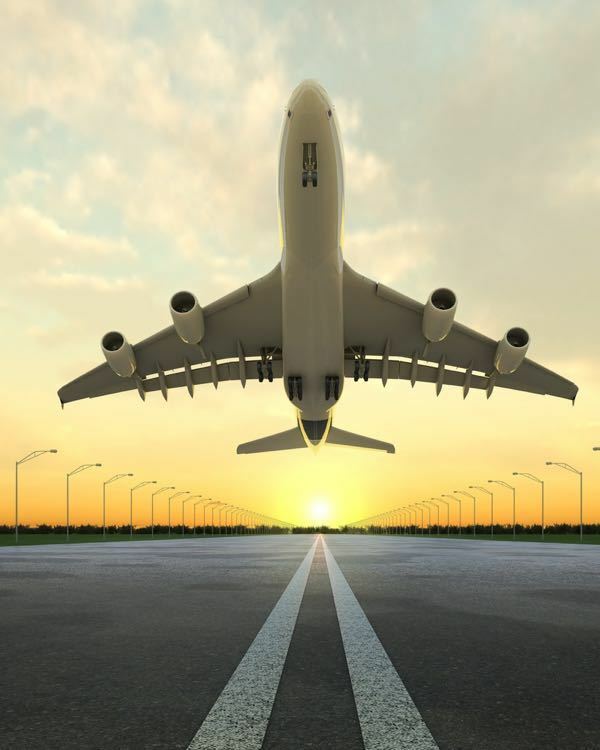 Most hotels and vacation rentals will expect you to prepay within 14 days of your arrival. All three village bases have Whistler kids ski school and Whistler childcare drop off points. Book as early as possible as in-season rates can be insanely high. 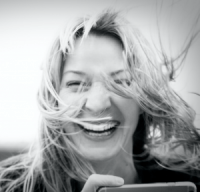 Note: Please also see my more in-depth post on the best Whistler family hotels. When renting a condo or house in Whistler, I strongly encourage you to thoroughly read reviews on the properties you are interested in. Few are true ski in/ski out and thus may require some extra effort to get on the hill or get to the Snow School. That said, renting a Whistler vacation rental can be a great way to save money on your Whistler family vacation. VRBO and Airbnb all list hundreds of family vacation rentals in Whistler. 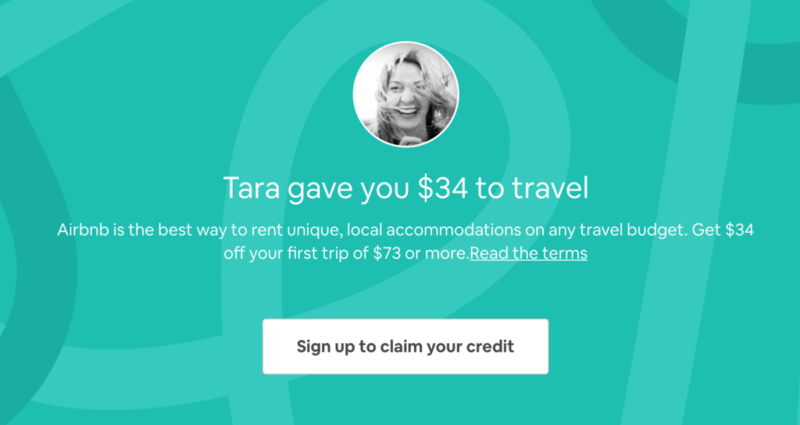 If you have never rented from Airbnb before, I can offer you a $34 USD ($45 CAD) Airbnb referral credit. 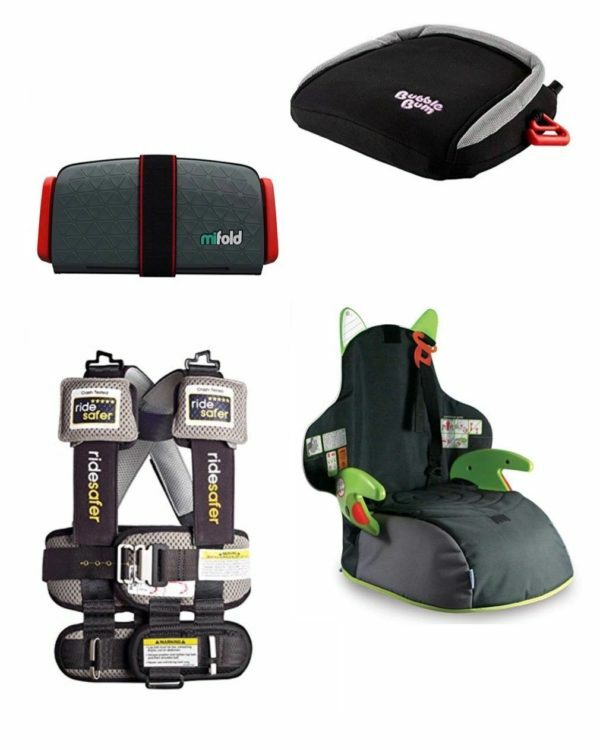 If need to rent baby gear in Whistler, Baby’s on the Go has a good selection. Looking for the best family friendly restaurants in Whistler? The great thing about eating out with babies, toddlers and older children in Whistler is that it is a resort town so almost every restaurant is prepared to pull out a high chair or some coloring if necessary. That being said, here is a list of particularly kid friendly Whistler restaurants. My preference leans towards restaurants that take reservations (since nobody wants to wait in line with little ones) and Whistler restaurants with a kids’ menu. Rating: Number of stars (out of a maximum 5) given by reviewers on TripAdvisor.com (as of Nov. 2017). Looking for the best Whistler family restaurants? 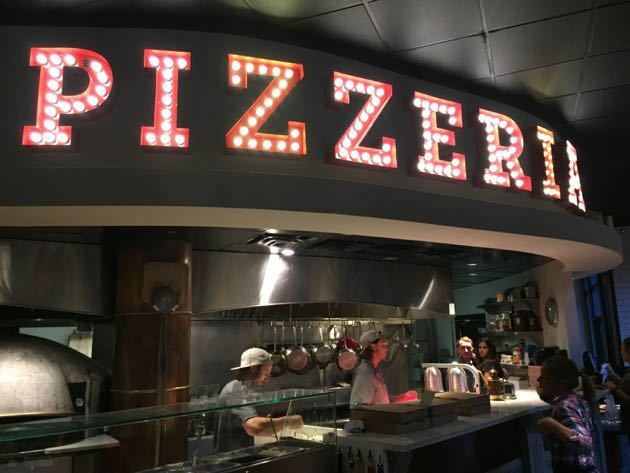 Fortunately, as a resort town, Whistler has a a number of options that making eating out with a little one easy and enjoyable. See the following options listed by area. First of all thanks a lot for sharing this wonderful information. Actually, I was planning to go on a ski holiday with my family and I was concerned about my daughter as she is just 5 years old.This is a really helpful guide.